Governor Lawrence J. Hogan, Jr., Lt. Governor Boyd Rutherford, Secretary of Transportation Pete Rahn, General Services, Secretary Ellington E. Churchill, Jr., and University of Maryland Systems, Chancellor Robert L. Caret welcomed hundreds of small, minority and women-owned businesses to their 4th Annual Business Opportunities & Entrepreneurial Training Summit on October 9th at the lovely Turf Valley Conference Center in Howard County, Maryland. 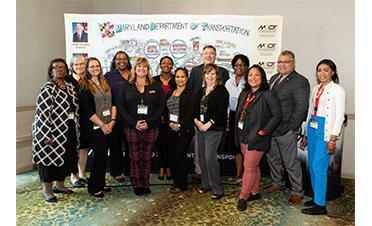 The purpose of the event was to prepare said businesses with knowledge on certification, winning bid preparations, navigating e-Maryland marketplace, strategies, marketing and learning about success stories from MBE’s. The full day seminar closed with a panel of minority business enterprises senior advocates discussing their first-hand knowledge about Maryland’s 40 years of minority business inclusion. The year was 1978 and Governor Harry Hughes signed into law new legislation that opened inclusion for African American trades only in construction as a 10% set aside. Since then, set asides have been ruled illegal and now the inclusion program is goal oriented. Thanks to the original African American legislators led by Senator Decatur “Bucky” Trotter, Governor Hughes and African American advocates such as Arnold Jolivet, Robert “Bob” Clay, Avon Evans, Rev. Douglas Sands, and Anthony “Tony” Robinson, scores of new diverse ethnic groups and women enjoy feeding from Maryland’s abundance. 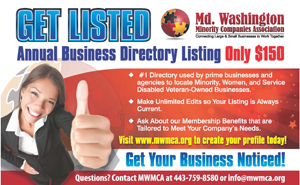 It’s been reported that Maryland’s Minority Business Program is the best inclusive program in America and perhaps the world, since America is the only country to practice economic inclusion. Special thanks to the following state employees who worked diligently to bring the event to us and they are: R. Earl Lewis, Jr., Louis W. Jones, Brenda Townsend-Milton, Tracie Watkins Rhodes, Denise Merritt, Cynthia Jones, Jack Howard, Cristen Ervin, Nick Cavey, Katie Crawford, Tom Hickey, and Joe Evans. Plus a big thanks to Beverly Hill of American Public Transportation Association for her historical knowledge and bringing folks together.